10 days Design Sprint at General Assembly. I worked with 2 other UX designers on this brief. UX Tools: Contextual Inquiry, MVP, MoSCoW Method, Usability Testing, Clickable Prototype. Five Guys is a casual burger chain on the mission of selling the best burger. We were tasked to leverage existing customer habits by introducing a digital solution that handles ordering and payment. Constraint: no change on the food making process. We helped customers to order faster without the need to download an app. We designed a cloud-based solution for people to order from their table and pay via mobile. Group of friends could also order at the same time and split bill easily. Competitive Analysis. Five Guys positioning need to shift toward a more restaurant-like experience and move away from the cheaper popular fast-food chains. How to avoid queuing? How to make the customisation enjoyable and not overwhelming? How to make the waiting time less boring ? We used an Affinity Map to help us visualise the information collected. We regrouped our datas by themes to see some patterns emerged. We then created a features prioritisation matrix to help us define a MVP. To create a realistic customer journey we used a Task Analysis to better understand the customer mindset. 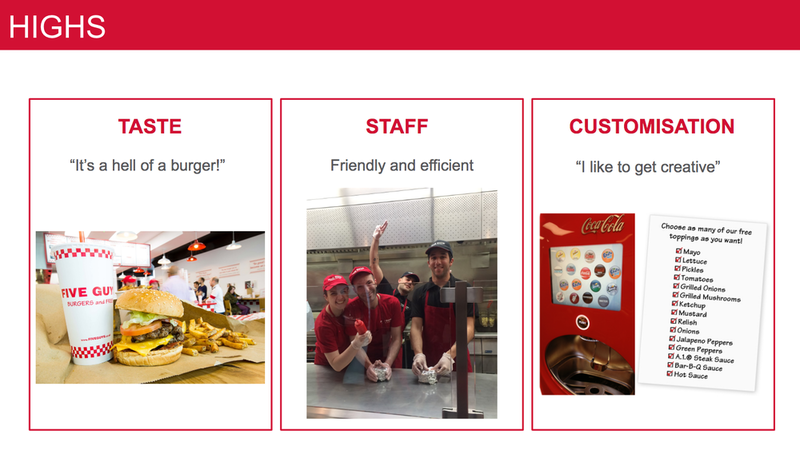 We created 3 personas and decided to focus on Steve, a burger fan because "taste" is one of FIVE GUYS key selling points. 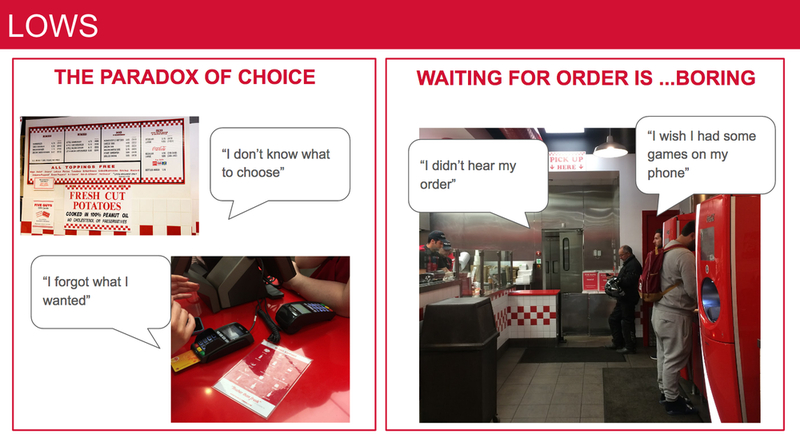 I created the current user journey showing 3 pain points: QUEUEING, ORDERING, WAITING FOR FOOD. I designed a new user journey showing opportunities to solve the current pain points (in grey). Easy remote mobile ordering to reduce queuing. Split bills among friends easily. 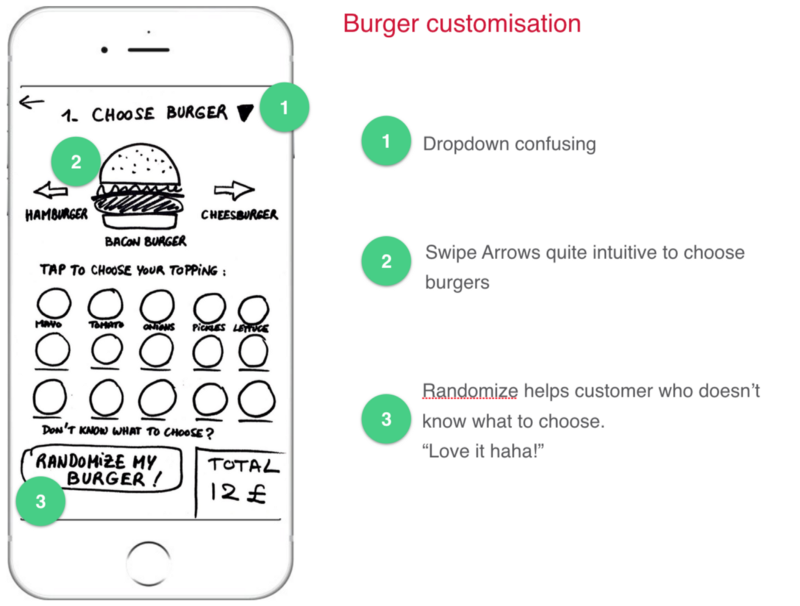 We focused our creative energy on 2 key screens: Burger Customisation and Bill Splitting. I created the paper prototype to be tested, we then shared the work to carry as many testings as possible. We iterated 6 times! from paper prototype to the final high-fi prototype (using Marvel). Our initial idea was a mobile app, however some people didn't want to download an extra app on their phone. We decided to brainstorm again with the user goals in mind, and came out with the idea of a Cloud solution. I sketched the 1st paper proto with the idea of customising the burger step by step. After some user feedbacks, Ryan created to a clickable low-fi prototype, but we still didn't make the order faster because our initial thought was a linear ordering process on mobile app. We went back to brainstorming and this is when we came out with the idea of a Cloud Based solution where everyone could order at the same time under the same order number. Annotated wireframes: I created these 5 screens to explore some ideas we had as next steps. Building a strong fan community. "Gamification" with points system to increase loyalty. Final iterations feedbacks were quite encouraging. Wish we had more time to implement it! Want to talk about your next big idea?